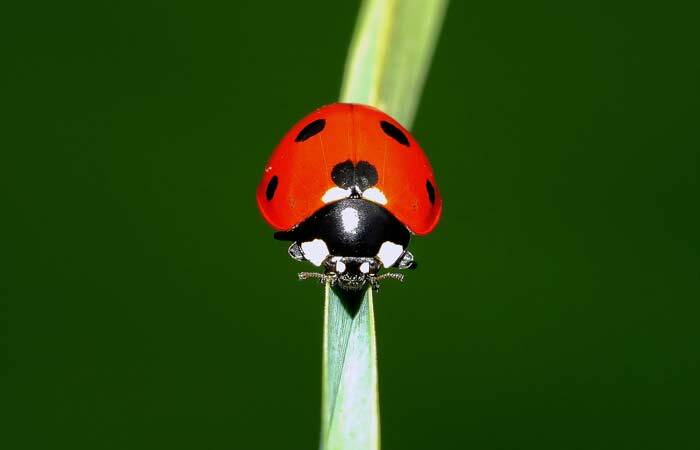 The primary predators of ladybugs are birds. One type of ladybug called the convergent ladybug beetle, is preyed upon by ring-legged earwigs, green lacewings and American toads. An estimated 5,000 species of ladybugs are distributed around the world. Otherwise referred to as lady beetles or ladybug beetles, these colorful creatures are popular pets and considered to be beneficial bugs by many gardeners and farmers. One of the defense mechanisms of ladybugs against their known hunters is their ability to discharge a distasteful fluid from the joints in their lower limbs. This unsavory secretion effectively deters some hunters. Ladybugs can also pretend to be dead when they sense that predators are nearby. However, these tactics are inadequate to dissuade other ladybug hunters, which include frogs, spiders, wasps and dragonflies.